If you're ever looking for party ideas I've got a new suggestion for inspiration: the business section of the book store. I'm serious. We had a great party in the office today and I came up with the idea after reading this book. There is no need to bore you with the details of the office, suffice it to say there's been more than a bit of upheaval lately. We have a good group of people with some pretty strong convictions. Perhaps more importantly, we all have a pretty wicked sense of humour. Even the senior folks were entertained by the party idea. 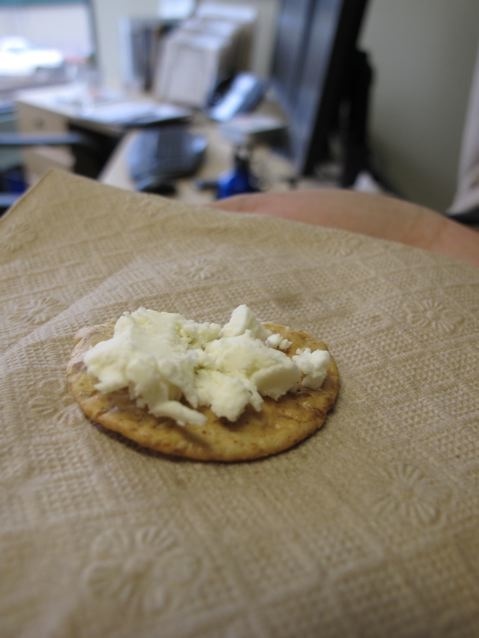 A little chat about finding our cheese when it comes to work, combined with an ongoing mouse problem in the building gave us the idea to have a cheese crawl in the office. People set up a plate of cheese and accoutrements in their office. Then, individually or in small groups, we wandered the halls visiting and tasting. And yes, we hid the cheese of one boss so that he was forced to yell, "Hey, who moved my cheese?" Hmm, maybe it's an inside joke. Quite surprisingly to me everyone totally got in to the idea. We had a great variety of cheeses from an amazing triple creme brie to a heavenly honey goat. Winner of the most unique cheese was the gjetost, or Norwegian brown cheese. It looks like fudge and does have a caramel taste to it. We ate it on mini rye with cucumber. I don't think it was very popular, but I really liked it. 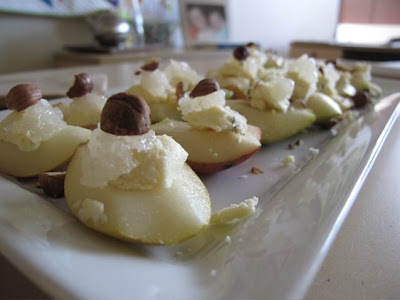 My contribution was the Seckel pears with blue cheese, honeycomb, and hazelnuts. We were served something very similar on our trip to the Okanagan in September (The dinner is gloriously summarized here.) The difference was that the pears we ate there were still warm from the sun and the blue was local Poplar Grove. I've taken to eating the pear, blue, honey combo as a frequent snack so I passed that on today. The consensus is that they would also make a fantastic holiday appetizer, or perhaps as an alternative to chicken wings this Sunday for the Grey Cup. And, of course, there was just a teeny bit of wine. Served in our glorious reusable plastic cups. Back when I was full of energy and vigor and swiss chard I entered my Frico recipe in the Safeway Cheese Champions contest. To be honest, I saw the ad on Facebook and was bored. Yup, I actually noticed the ad, that's how bored I was. So I entered and found out recently that I won something. Sadly, it was not the grand prize. That means no Mama/Daddy time in Lake Louise for free. But I did get a grocery gift card and it will buy our dairy for a couple of weeks. No complaints there. And, if you are in a Safeway in the coming weeks, probably only in Western Canada, pick up the Safeway Cheese Champions book. 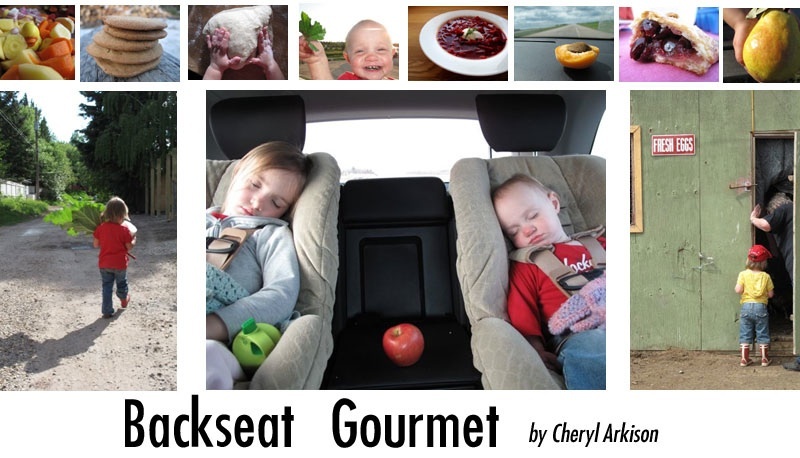 You will find my recipe and more in there. Oh, and a teeny tiny picture of me and The Monster. After a very busy morning gluing brown circles to bigger brown circles, building floor puzzles of cats, and dancing to a jazzy version of Spiderman it was time to settle down for snacks. It was our day to volunteer at preschool. As the parent volunteer responsibilities include directing the craft, helping the teacher with all the regular tasks, and cleaning up at the end of the class. Our kid gets to be VIP that day, getting to go first for all activities and bringing something special for show and tell. Oh, and the parent gets the pleasure of bringing a snack. Now, it should be painfully clear by now that I'm not the apple slice and snack pack kind of mom. I bake cookies and muffins when they ask me to. I don't bring juice for other people's kids. 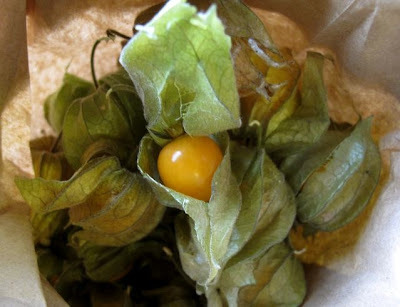 And when it is our turn to bring a snack I think it is a great idea to bring something likely foreign to the average Canadian three year old, like a cape gooseberry. I wonder what the other parents thought when they saw our snack reported on the calendar. A cape gooseberry isn't a common fruit. I always associate it with hotel fruit trays at meetings. Their distinctive papery coverings serve more as garnish to most of us. But peel that back and taste the sweetly sour fruit with the hint of sunshine. It's kind of like a natural version of sour gummy candy, minus the jelly texture. Personally, I love them. But I wasn't sure about the kids. I baked cookies as a fall back position. The cape gooseberries? They went over surprisingly well. 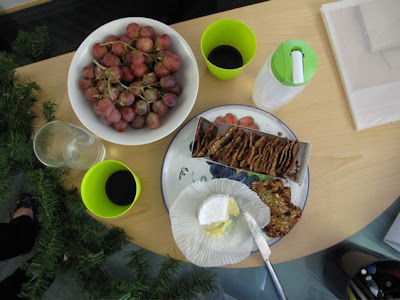 In a class of eight kids one outright refused to even have the gooseberry in his bowl, stopping just short of a complete fit over the fact that it even touched his cookies. A couple more sniffed it and merely set it aside. Two more had to be cajoled... er, encouraged to try the fruit. And three happily tried them. One kept asking for more and more, leaving his cookies aside. Way to go kid! My kid tried hers, declared it too sour, and returned to her cookies. The kid that loved them? His dad is a chef. I have a desire to make my own cottage cheese one of these days, just like my Baba used to. 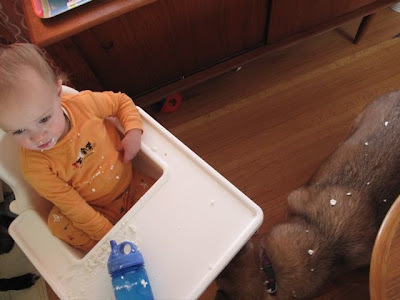 That won't be happening until Smilosaurus learns to keep it on the high chair tray, at least, instead of decorating the dog. The worst part is that we usually rely on the dogs to clean up after she eats. What am I supposed to do when this happens? I can be reached through email - mamaark (at) gmail (dot) com.